When the wind stops blowing and the rain stops pouring down, there's some pretty fun fishing to be had in Sooke these days. 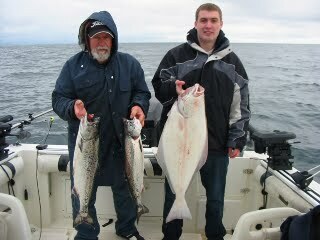 The winter spring salmon are in thick, mostly from 120-150' deep, from the Sooke Harbour Mouth west to the trailer park. Most people are fishing hootchies with some sort of glow in them, 10 feet off the bottom. Some people are using anchovies, but you have to catch a lot of small ones until you get a keeper. The keepers have mostly been 5-10 pounds, though we heard a "friend of a friend" that says they caught a 17 pounder yesterday -- just to the west of Possession Point in only 60 feet depth. Gord from Foghorn Fishing Charters fished last week and caught some nice 10lb spring salmon and a 25lb halibut, using hoochies and spoons right on the bottom. The picture is of his clients Al and his son Derik from Eastern Canada. The crabbing in Sooke Harbour has been excellent too -- lots of big male keepers. So...keep your eye on the weather report, watch for a sunny day (or bring your rain slicker), and get out there and go fishing!